When you have Maestro Hilario Durán involved in a project you can be assured of its quality. For those unaware, Hilario Durán is one of the best pianists on the planet. Combined with his musical soul mate Mark Kelso, you know the rhythm section will be incredibly powerful. 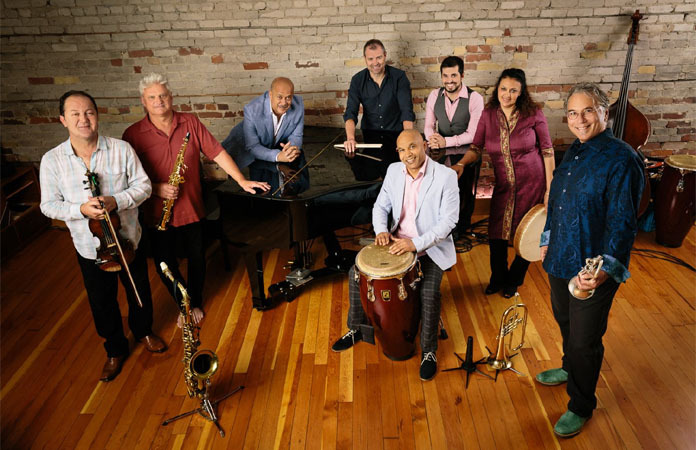 Add to the mix, countryman and bandmate on many projects, Joaquin Núñez Hidalgo as the percussionist and be prepared to experience Afro-Cuban percussive sounds to delight the senses. 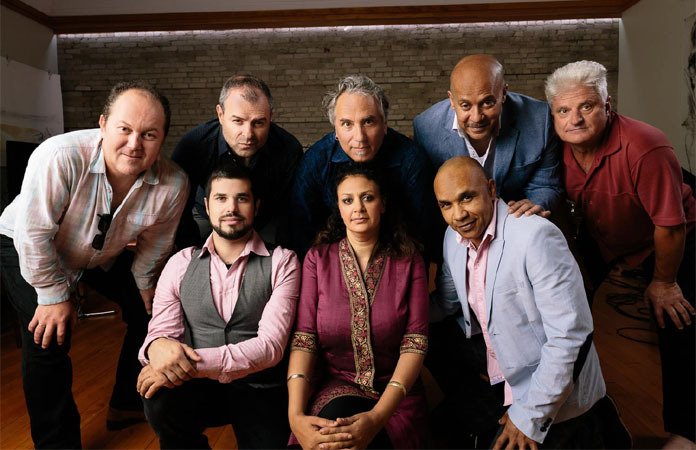 The other members of David Buchbinder’s Odessa/Havana for this night’s performance included, David Buchbinder, trumpet & flugelhorn, Aleksandar Gajic, violin, Maryem Hassan Tollar, vocals, Quinsin Nachoff, reeds and Justin Gray playing bass. David Buchbinder’s Odessa/Havana is an award winning, genre defying band of extreme musicality. They have been described as an ensemble that mixes Jewish and Afro-Cuban cultures, I believe it goes much deeper than this. Each musician brings their own story to the stage and expresses it with passion and the highest level of skill. The concerts double bill opened with Kuné and David Buchbinder’s Odessa/Havana closed out the show. The first song by Odessa/Havana had a strong klezmer feeling to it with violin wailing and accompaniment by bass and percussion. The percussionists stood out at once in their collaborative approach by playing off each other as if completing a sentence or a thought. The percussionists, Kelso and Hidalgo provided the undercurrent of Afro-Cuban dynamics. The violin was the driving locomotive force that paved the way for Buchbinder’s trumpet and Natchoff’s clarinet to add the impressive swing dimension all the while Hilario Durán leads with pounding percussive piano playing, intermixed with lightning fast runs, intricate trills, triplets and the occasional hand signal to the ensemble to transition from jazz to klezmer or some other bridge. Many of the compositions performed were from the groups 3rd album, the 2018 release, Conversation of the Birds. The songs seemed to blend many styles of music, I heard elements of Baroque, Andalusian, Flamenco, Middle Eastern, Yiddish, Tumbao and hard swinging jazz. The chanting, narration and vocalizations of Maryem Tollar were delightful and her middle eastern style of singing fit perfectly with the music. A song with a name like “Coffee Works” you would expect to be energetic and you would be correct. A hyper active song, frenetic in its pace and pounding with percussive intensity, snake charming clarinet, wicked trumpet and choppy arco violin. Another composition title per Hilario Durán “Nameless” he opened it with a beautiful melody, violin and bass join in col-arco and the rest of the musicians flow into the song, trumpet and clarinet providing a mournful refrain. The final song of the evening featured four members of Kuné returning to the stage, a musical clinic ensued. The song featured a drum solo by Mr. Kelso that was what you would expect, simply mind blowing. Aline Morales and Matias Recharte would join in with Hidalgo to offer support in the percussion department while Luis Deniz and Selcuk Suna would join with Buchbinder and Nachoff in what became a cutting contest. The final feature of the evening seemed to come back to Hilario Durán who played with outstanding skill and passion. A multi cultural evening of musical performances that exemplified how our cultural differences can come together in beautiful harmony to create an overwhelming display of peace, love and togetherness.